Is stress making you fat? Are you constantly feeling stressed out from your hectic schedule? Has that extra holiday weight become a year round battle to lose? Well, stop trying those fad or trick diets and try choosing something that actually works, Cortislim. Extra weight can be triggered from stress and anxiety. A hormonal imbalance of cortisol may be to blame for the extra belly fat or 'spare tire' look. Cortislim works with your body to monitor and balance levels of cortisol production in order to help you lose weight along with reducing stress. Best of all, Cortislim is an all-natural, ephedra free weight loss pill. If you keep accumulating belly fat and feel constantly stressed out from your daily routine, Cortislim just might be the answer you are looking for. The reason for weight gain may be an over production of cortisol in your body. This hormonal imbalance may trigger over eating and can be spurred by anxiety and stress. By controlling cortisol production in the body, users should have less food cravings and feel an increase in energy levels. 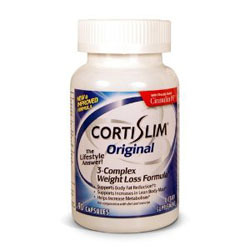 Use Cortislim to help you try to beat that mid section bulge and help you feel more energetic and confident. With your help we can reach more people and let them know about Cortislim 60CT whether this product works or not.